Night Hunter House is a handmade three-story Victorian-style dollhouse built to accompany the animated film. Scenes from the film Night Hunter are viewed through the windows of this installation piece. 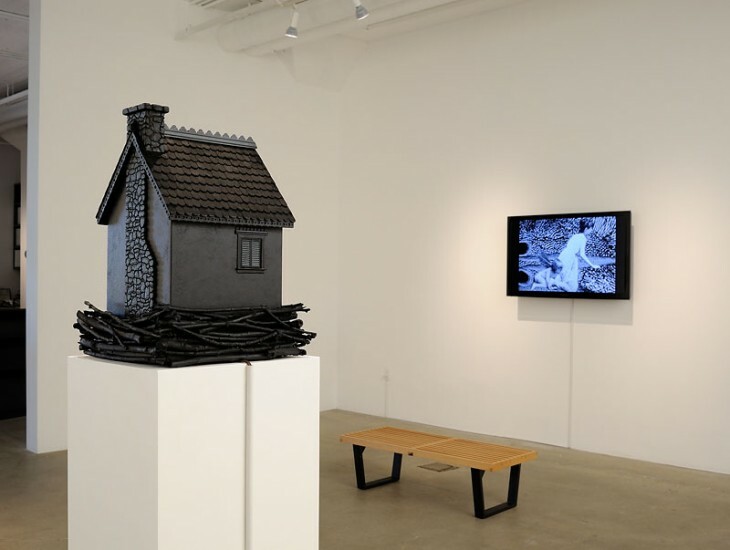 Tiny video screens play loops from the film, embedded amidst elaborately decorated rooms filled with tiny light fixtures, antique lace, bird eggs and moth specimens. The resulting dreamscape is at once disquieting and mesmerizing, both beautiful and haunting. 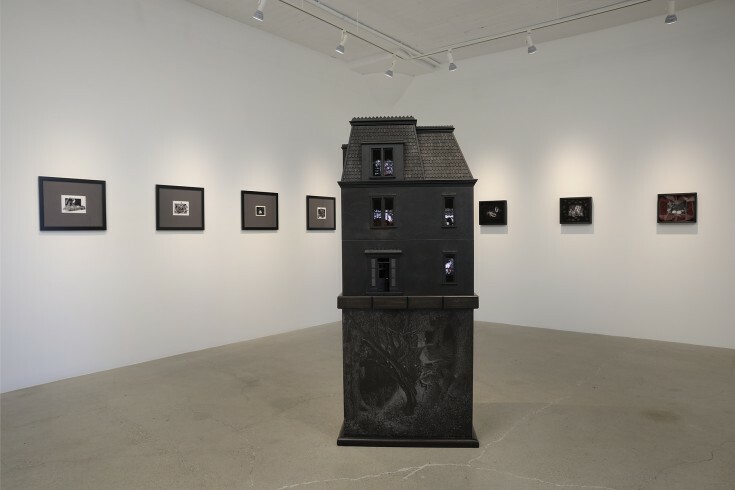 Night Hunter House, and the unique experience of the film viewed through this landscape, has exhibited extensively since 2011: before arriving at Catharine Clark for this exhibition, Night Hunter showed at Galerie West in the Hague, Netherlands; Tufts University Art Gallery, in Boston; the Virgina Museum of Contemporary Art; and The Hood Museum of Art at Dartmouth College in Hanover, New Hampshire. Night Hunter (2011), incorporates images of Lillian Gish taken from silent-era, live-action cinema. The narraitve unfolds intuitively, and reveals itself in the process of construction. To produce the film, Steers generated over 4,000 paper collages which combine fragments of 19th century illustrations with images from four silent-era moving pictures. 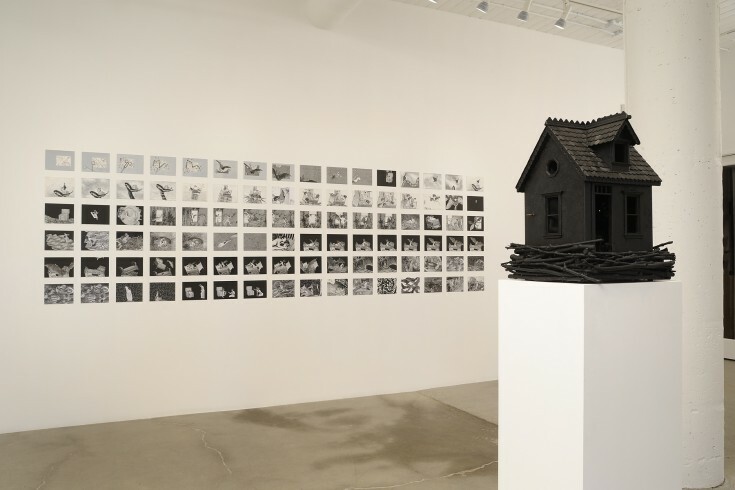 Steers’ process is painstaking and meticulous—Night Hunter took over four years to make, with approximately eight collages required to produce a single second of film time. 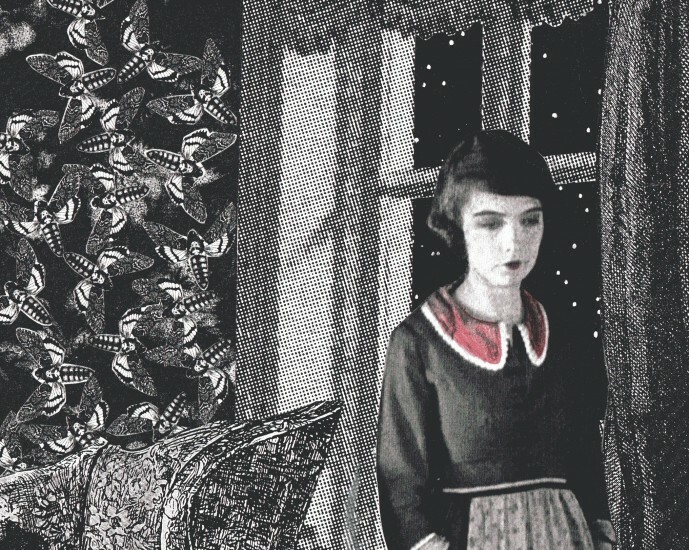 In some instances, Gish is cut out of specific scenes and reconfigured in collage environments, while collage materials are applied directly to printed film frames in others. The subsequent fluidity becomes a critical element in the texture of the film, and the identity of the principal character. Transitions, both biological and metaphorical, are central themes. The collages were photographed in 35mm on an Oxberry animation stand. Larry Polansky composed the music and sound elements.